It's said that love is blind. Well, actually, for a majority (including me) in the Indian sub-continent, our love for cricket certainly is! In this part of the world, where people adore the game and where cricket stars are worshipped like demi-gods, it's not unusual to find seemingly unending queues outside the stadium gates, stretching up to the end of the roads, with hundreds of eager fans waiting for hours on end for tickets, sometimes even under the scorching sun, however daunting that might be. And they don't mind shelling out huge sums of money either, for a ticket! Some people, when they fail to get a ticket, even climb up to their rooftops if a cricket stadium is nearby, in order to get a peek at the live action being played inside it. One may also come across hordes of people -- passers-by, street vendors, school kids or office goers returning home -- gathered outside an electronic shop outlet (or just about any shop with a TV) when a match is on. The commentary may not be audible enough to reach them but they still flock outside to catch the live action. And while commuting via public transport, if we find a co-passenger listening to the cricket commentary on his radio set, we simply can't help asking, "score kya hua?" (what's the score?). Invariably, within minutes, that person gets surrounded by a mini-crowd of cricket enthusiasts, all ears to the radio updates, unmindful of the sweaty body odours or the space crunch. It's a given that the passion and hysteria that cricket generates among the fans is unmatchable. Anxious faces before tv screens, watching with bated breaths, ball after ball and praying hard for their team's success are a pretty common sight. Any Indian would get goosebumps when collective chants of "Indiaaaaaaa... India" reverberate around the cricket stadium, which has now become a norm. Every major victory of the team sets off frenzied celebrations with the euphoric fans bursting firecrackers, dancing on the streets, hugging each other, distributing sweets and waving the national flag. And when the team loses, a pall of gloom descends across the entire nation. No other sport in India evokes such feverish intensity and unadulterated passion that cricket does. The nation almost comes to a grinding halt and the streets and all major thoroughfares wear a deserted look each time when our team is at the cusp of a major title win or if our favourite cricket star is on the brink of a career milestone. Such is the madness for cricket here that even atheists become God-believers and start praying hard when their favourite star is at the crease. Those who would have seldom accompanied their families to temples, keep fasts and some even give up non-vegetarian food for a week or so, to seek divine blessings for their favourite team. Wearing a particular shirt or placing the tv set in a particular direction or sitting at a particular place on the couch, or some other such superstitious act -- the lengths some of us go to support and ensure success for our favourite teams and our unceasing affinity towards cricket might be incomprehensible for a cricket non-enthusiast; the magnitude of our madness for the game may even baffle and bemuse him but certainly not the ardent cricket followers. 'Passion for cricket' runs in our veins. Teens bunk off school or college (even at the risk of falling short of attendance), or make excuses for not going to their tuition classes; they cajole and butter up their mommies to be allowed to watch matches on TV during exams; adults take fake sick leaves from offices on promising match days, and cancel all their pre-plans for the day; both young and old invariably stay glued to their television screens all through the course of the match; and if at all there is a power cut, the good old radio set is always kept as a standby in most houses to stay abreast of the latest scores -- we cricket fanatics leave no stone unturned in our efforts to ensure that we do not miss out on even a single key moment in a match. And with the advent of IPL -- arguably the biggest domestic tournament in the slam-bang version T20 --, cricket mania has touched a crescendo among the masses. When some of the most elegant and belligerent batsmen and the fiercest and canniest of bowlers from around the world, play with and against the established and the rookie Indian cricketers in IPL, almost every match creates a frisson of excitement among the people. Where else would have one got to witness Sachin Tendulkar and Ricky Ponting -- two of the best batsmen of the contemporary era -- opening the batting for Mumbai Indians and facing Muttiah Muralitharan, arguably the best off-spinner to have played the game? There have been many such mouth-watering contests in almost every match of IPL, every season. Undoubtedly, people have lapped them up all with glee. With such a heady brew of cricket, glamour and glitz, IPL has already become the cynosure of all eyes and cricket has never been the same since. A couple of years back while the IPL season was on, I was in Hyderabad on an official trip. But as it turned out, my work there got finished almost a week before the expected time. Now I had a week to spare. So it was a great excuse for me to go visit my home city Bhubaneswar and give my parents a pleasant surprise. But it's not always easy to arrange flight tickets at the last moment, especially during the peak summer rush. And I didn't want to waste even a day. So I decided to book a tatkal ticket on the first train that I could get into, for Bhubaneswar. The journey wasn't easy though. To start with, as it happens with most tatkal tickets, I had been alloted a side-upper berth along the aisle -- a berth that probably has the least given space to even stretch one's legs freely. It wasn't very comfortable to lie on. And as luck would have it, my seat was among a big noisy family. Whenever I tried to take a nap, as if on cue, I was always greeted with someone's shrieks or loud conversations. As much as I tried to block it all out, it was only getting noisier. I could only wait for the night to draw in for the activities on the aisles to subside, so that I could catch some sleep. After dinner, I had hardly had an hour's sleep when the sudden lurching of the train and the screeching of its brakes at some nondescript station woke me up from my harried sleep. It was not the type of night's sleep I have been used to in the luxury of my own bed. All night I continued to have great difficulty in my attempts at sleep. To make matters worse, our train got inordinately delayed on the way because a goods train had derailed. What was supposed to be a surprise visit to my hometown was now turning out to be a long, tedious trip -- though I had embarked on an 18-hour journey and the train was to reach Bhubaneswar in the morning the next day, but now it was halting frequently at different stations. It was well past 2 in the afternoon and we had reached only as far as Berhampur, Bhubaneswar was still some 150 kms away! I hadn't slept the entire night and my whole body was now aching and feeling sore. As much as I wished to reach home at the earliest, the ride was going slow and laborious. It was slowly becoming unbearably irksome. I could take it no more and deboarded as the train reached Khurda station (which is some 20 kms away from Bhubaneswar). It was well past 4 by then and so I thought it better to hire a cab from there to my home. My spirits had sunk to their lowest ebb, I was terribly hungry and tired as hell, so as I got into the cab with my luggage, all I wanted was to reach home at the earliest. But while we stopped at a traffic light, my eyes fell on a small crowd that had gathered outside a tv showroom on the roadside. They must be watching some cricket match, I thought. As we drove further, I noticed another animated crowd outside a tea stall and they were clapping and cheering loudly, chanting 'Gayle, Gayle'. I understood that an IPL match was underway and the giant West Indian was at the crease. Just then, I got reminded from the morning newspaper read that Royal Challengers Bangalore were to take on Pune Warriors that evening in a league match. Going by the people's reactions there, I could make out that Gayle was being at his murderous best. I couldn't resist the temptation anymore. Although my house was only some 45 minutes drive away but I thought, by the time I would reach home, Gayle's innings would have finished. And no sane cricket fan would ever choose to miss watching a Gayle carnage. So I immediately alighted from the cab and let him go and instead joined the horde at the tea-stall to enjoy watching Gayle bat. For a moment, I almost forgot to take out my luggage from the cab in excitement. The next one hour was pure entertainment at its best. Gayle was hitting every ball with sheer disdain, almost sending the ball into the orbit. It was just stand and deliver as the ball kept on sailing into the stands. Yes, I was dead tired an hour back and wished to reach home as fast as I could but all I cared about now was how many runs he would eventually end up with. By now, I was also feeling discomforted by the pressure that had built up in my bladder, which was increasing every minute. But I didn't want to move an inch from there. The greater my urgency for release became, the more determined I made myself not to move from there. I just stood there still, keeping my legs tightly together to control the urge and continued watching Gayle bat. I fought to convince myself that watching Gayle's knock was more important than relieving myself. He went on to score the fastest ever T20 century off only 30 balls and remained unbeaten on 175 from a mere 66 balls. And that contained 13 fours and 17 sixes! It was only after the innings got over did I go to relieve myself. After having witnessed the Gayle mayhem, strangely all my fatigue and exhaustion had somehow flown away! I hired another taxi from there and by the time I reached home, it was well past 7 in the evening. Upon seeing me, both mummy and papa were pleasantly surprised and their joy knew no bounds but when I told them about my feat at the tea-stall, they were left dumbstruck. They didn't know how to react. Others may laugh at my imprudence but I feel everything was worth it. It's not always that one gets to witness live a marauding innings as brutal as that knock. This infatuation for cricket in India is palpable and yet is fathomless. Well, certain things are probably not going to change ever. Young kids in the bylanes will continue to smash window panes with meaty blows. Posters of their cricket idols will continue to don the walls of aspiring cricketers. People will continue to come up with excuses (however silly they might be) to bunk work or studies on important match days. Team jerseys will continue to fascinate the cricket buffs. Post match analysis and debates about the possible batting orders or the bowling combinations will continue to dominate the dinner table discussions in most families. And no matter how the team had fared in the previous match or what the outcome was, the incorrigible cricket fans will continue to throng the stadiums without fail. There is no reason to believe otherwise. 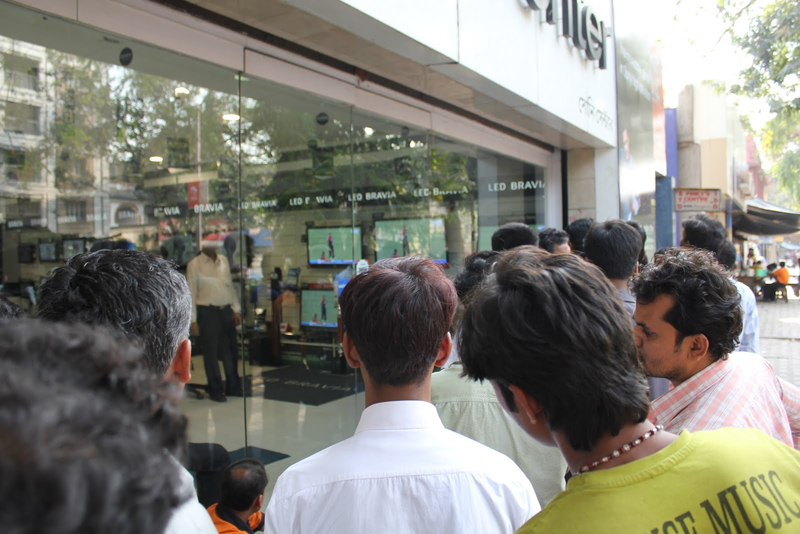 So also will continue the familiar sights of passers-by huddled up outside tv showrooms or tea stalls to watch a match. After all, "it’s not just a game, it’s a celebration!"